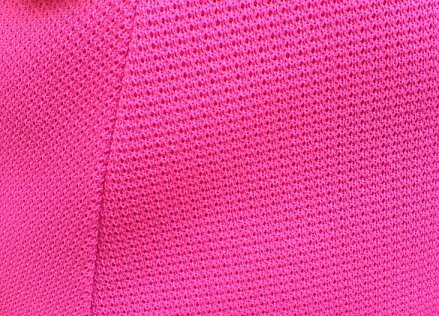 Vintage 1960s pink mini dress with white at collar. This is a charming and very pink mini dress from the 1960s. It's in a man-made fabric with a slight nubby texture and has probably been professionally hand made. Although unlined, it's very well made: the sleeve edgings are taped, and some internal seams have been overlocked (unusual for the period, although the overlocker was first used in the 1920s). It fastens with a long zip and hook and eye at the back. The bodice is shaped and the skirt slightly A-line. The round neck is set off with a little white stripe. 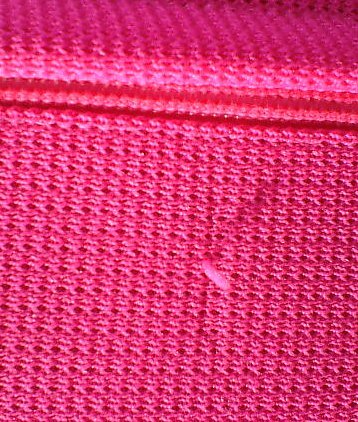 Although the dress is generally in very good condition, there are one or two little pulls in the fabric - not noticeable in wear. It's designed to be a close fit, and the fabric has a little stretch to it: best fit, probably a UK size 8-10. Approximate measurements are: bust measured under the arms 35 ins/89 cms, waist 29 ins/74 cms, hips 40 ins/101.5 cms, length from back of neck 34 ins/86.5 cms.